The Lodge wishes to recognize the outstanding contribution made by a Mason, whether a member of The Heritage Lodge or not, to the Craft within Ontario. This will be in the form of a Plaque called the “William James Dunlop Award”. It is not intended to be based on any particular time frame, and not more than one given per year, but is given for a continuing contribution to Masonry. William James Dunlop was born in Durham, Ontario, on June 24,1881, the son of the Rev. James Cochrane Dunlop and Agnes (Freel) Dunlop, both of whom are now deceased. At the age of seven he enrolled as a pupil in a little rural school near Durham. When he was ten years old, the family mover to Stayner, where his education was continued in the Stayner Public and Continuation Schools and then in the Collegiate Institute at Collingwood and Clinton. He attended the Model School in Clinton and taught for a year in a rural school at Hullett. Dr. Dunlop entered the University of Toronto in September, 1900, as an undergraduate in the Honour Course in Modern Languages. At the end of his first year, he stood first in the University in English of the first year, and had a high standing in French, German, Latin and Italian. He then left the University, and, after teaching for some years, completed the work for a B.A. degree, partly at a summer session at the University of Toronto, and then, after transfer and a good deal of study, was awarded the degree of Bachelor of Arts by Queen’s University in 1912. For three years he was Principal of the Public and Continuation School at Tavistock; then for one year Principal of the King Edward Public School in Peterborough; after that, for two and a half years Principal of the Queen Alexandra Model School in the same city. On December l, 1910, Dr. Dunlop joined the staff of the University of Toronto Schools where he remained until June 1918. In 1912 he became Manager of “The School’; a teachers magazine and, from 1913 to 1921, he was both Editor and Manager which, under his direction, built up to a nation-wide circulation among teachers and inspectors. For some years he was the manager of the Canadian Historical Review. The work of editing and managing was carried out concurrently with his duties in the University of Toronto Schools and the Faculty of Education of the University of Toronto. In 1915 and 1916 he was a Lieutenant Instructor in the Canadian Officers’ Training Corps. From 1918 to 1920, he was a lecturer in School Management and in Methods in History, Geography, Spelling and Hygiene in the Faculty of Education, University of Toronto. On July 2, 1920, Dr. Dunlop was appointed Director of Extension for the University of Toronto. This was his work for thirty-one years, but, in addition, he was acting manager of the University of Toronto Press during World War II. In 1926 he graduated from the University of Toronto with the degree of Bachelor of Pedagogy. In 1934, Dr. Dunlop founded the Canadian Association for Adult Education; was President of that Association for the first three years and Chairman of the Executive Committee for several years subsequently. He has contributed frequently to educational journals in Canada, in Great Britain and in the United States. During World War II he was chairman of the Committee set up by the Citizens Committee for troops in Training; was in charge of the education of the Troops in Military District 2. He was Chairman, at the same time, for Canadian Legion Educational Services. He was Chairman of the Board of Examiners in Optometry for Ontario for two years. He was a member of the General Committee of the Leonard Foundation and resigned as Chairman of the Board of Trustees of Wycliffe College in 1959. In June 1942, he was made a fellow of the Canadian Credit Institute (F.C.I.) and in the same month was awarded an Honorary degree of Doctor of Laws (L.L.D.) by the University of Western Ontario. He Was Chairman of the Canadian Legion Committee (Ontario Command) of Education and Citizenship. In June 1953, he was awarded an Honorary Degree of Doctor of Laws by the University of Ottawa, in May 1956, by Queen’s University, and in June 1957, by Assumption University, Windsor. For two years, 1939-1939, Dr. Dunlop was Grand Master of the Grand Lodge A.F.& A.M. of Canada, in the Province of Ontario, and he subsequently was elected as Grand Treasurer in July 1941, from which position he retired in September 1959 although continuing to discharge duties in Masonry. For many years he was Superintendent of the Sunday School of St. Paul’s Anglican Church, Bloor Street, Toronto. In 1905, he married Mary Gillespie, daughter of the late Duncan Gillies of Stayner, who passed away in July, 1942. He is survived by his widow, the former Eveleen Kilby, whom he married in 1933. Dr. Dunlop was appointed Minister of Education on October 2,1951, and retired from that office on December 16,1959, but continued to serve in the Cabinet of Ontario as a Minister without Portfolio until his retirement from that position in November 1960. At that time, he became Vice-Chairman of the University Coordinating Committee, thus making available to the Government of Ontario, his great talents and capacity from his experience in the educational field. At his death he represented the Riding of Eglinton in the Ontario Legislature. M.W. Bro. Dunlop was initiated in Peterborough Lodge, No.155, Peterborough, on October 30,1908, at the age of 27 years. 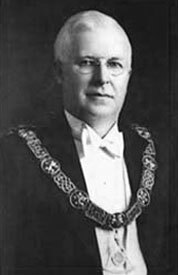 He was Worshipful Master of University Lodge, No.496, Toronto, in 1922. He was life member of University Lodge, Antiquity Lodge, No.571, Toronto, Grey Lodge, No.589, Toronto, Peterborough Lodge, Prince of Wales Lodge, No.630 ,Toronto, Acacia Lodge, No.61, Hamilton, Malahide Lodge, No.140, Aylmer, Nickel Lodge, No.427, Sudbury, Ulster Lodge, No.537, Toronto, Kilwinning Lodge, No.565, Toronto, Remembrance Lodge, No.586, Toronto, St. Andrew’s Lodge, No.16, Toronto, High Park Lodge, No.531, Toronto, St.Alban’s Lodge, No.514, Toronto, William James Dunlop Lodge, No.675, Peterborough, and Melita Lodge, No.605, Toronto. He was a Past First Principal of University Chapter No.421, Royal Arch Masons, and an Honorary 33rd Degree member of the Ancient and Accepted Scottish Rite. At the funeral service held at St. Paul’s Anglican Church, Toronto, held February 6,1961, the church was filled with close relatives the representatives of the the Federal and Provincial Governments, the Judiciary, the City and Metropolitan Toronto, the Departments of the University of Toronto, and all branches of Masonry. Our Grand Lodge was represented by the Grand Master, Deputy Grand Master and all Past Grand Masters, members of the Board and a host of brethren and friends. Interment was in Mount Pleasant Cemetery. So was laid to rest one of the great men and Masons of our time.